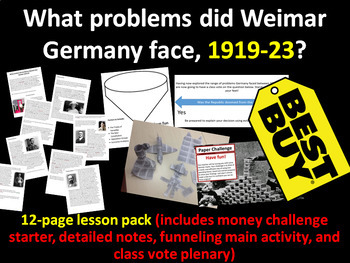 This lesson will introduce your students to Weimar Germany fantastically well. Students complete a maths challenge in the starter task to introduce them to some of the financial difficulties Germany was facing. After this the class work through a set of exceptionally detailed notes before completing a funneling activity designed to help them discriminate between evidence to form a judgement to help them answer the Key Question. The lesson concludes with a class vote. I hope your students get as much out of this lesson as much as mine do.